It's an illogical thing. In the 1930s companies like Leitz and Zeiss-Ikon sold cameras with black paint only. The chroming process wasn't yet perfected. The first satin chrome Leica probably was a Leica II, made in 1933. Leitz made 1321 chrome Leica IIs in 1933, according to the Leica Pocket Book from the Laterna Magica series (get one if this stuff interests you). 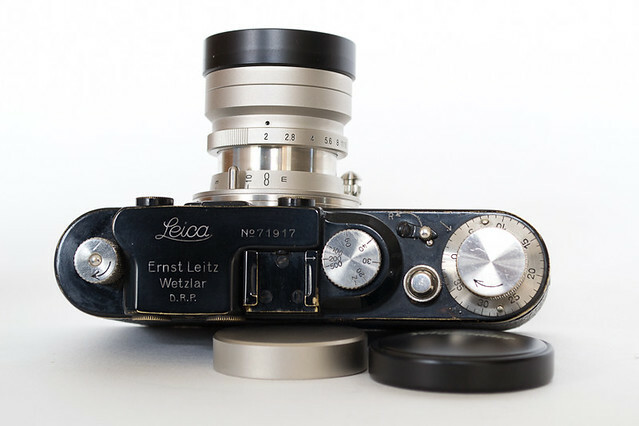 During and after World War II there were only a few black paint Leicas made. That is, according to the serial number lists. There are 800 black paint Leica IIIa cameras listed, but so far none of them have been seen so the listing very likely is incorrect. After WWII Leitz had problems with contaminated chrome baths at the factory and as a result many of the 1946 and 1947-made Leica IIIc cameras have chroming that flakes and bubbles. "26. Sandblast, hot cleaner without current, cold cleaner with current, warm rinse, followed by cold rinse, hydrochloric dip, copper flash, cold rinse, sulphuric dip, cold rinse, bright nickel-plate, warm rinse, hydrochloric dip, bright chrome, drag-out rinse, cold rinse, hot rinse, and dry." The result is a durable satin chrome finish. Although the chrome plated cameras grew into higher demand before the war, I consider the black paint pre-war screw mount cameras to be true objects of beauty and desire. Leica II (1932, 718th camera made) with nickel Voigtländer Heliar 50mm 2.0, a lens modelled after the rigid Summar. Enter the modern design of the Leica M3 in 1955. Leitz had to step up their designing, developing and testing of a new model camera since the end of the second World War saw all German patents cancelled and the Japanese companies had taken to copying the Leica screw mount design in huge numbers. The Leica M3 was a patented camera, as was the Leica M bayonet mount. Some Japanese manufacturers tried to incorporate the German innovations into their own models (the Nicca type 5 has a swing-up back door and a film advance lever on a screw mount body!) but quickly turned to developing and producing SLR cameras. The new Leica M3 was brilliant in every aspect. But, it only came in chrome. Press photographers were quick to request a camera that was more suited to their needs and as a result, Leitz built the Leica MP in 1956 and 1957. (Nowadays it is dubbed the 'original MP' since there is a new model MP that currently is still built by Leitz). The original MP had the looks of an M3 but the frame counter of an M2, it had frame lines for 50mm, 90mm and 135mm lenses, a trigger winder called 'Leicavit MP', the -vit part coming from 'vitesse', not 'vitamins'. It was the first modern Leica M that was available in black paint (another photo journalist request) and Leitz built 138 black MPs in 1956 and 1957 (against 311 chrome ones). Up until today, the black paint Leica MP from the 1950s is the Holy Grail in black paint cameras. And it shows: in 2014 a chrome model and a black paint model were auctioned off at Westlicht Camera Auctions. The chrome model (serial MP-375) was estimated at 50.000 to 60.000 Euros, the black paint model on the other hand was estimated at 150.000 to 180.000 Euros. Not all photo journalists could afford (or needed) a Leica MP. Most of them were perfectly fine with a regular M3. But some wanted that regular M3 to be a black camera anyway. The Leica M3 was made from 1955 to 1968. Over 225.000 cameras were built altogether. Of that huge number, a mere 7080 were delivered in black paint by Leitz Germany, another 3010 in black paint by Leitz Canada (and only 144 in olive drab, for the West-German military). The Leica M2 (by some considered the ultimate photo journalist's camera) was supposed to be a slightly simpler camera with 35-50-90mm frame lines, which made it more suitable for press work. As a result, that camera was also made in black paint, of the grand total of 85.200 cameras that Leitz Germany and Leitz Canada built between 1958 and 1967, only 1871 were marked as black paint cameras. Furthermore a number of 5400 is listed with code 'D/A', an abbreviation that I cannot interpret. Even combined, these numbers make black paint M2s rarer than black paint M3s. With the M4 (which is the true ultimate press camera in my opinion), change came. The M4 was made in both black paint and in black chrome. The black chrome was a novelty, where Leitz tried to accomodate both the photo journalists that needed black cameras for their daily work, and those who complained about the decreased durability of the black paint cameras. The M4 was made from 1967 to 1975, total amount was slightly over 60.000 cameras, of which 8990 were delivered as black cameras. In the listing, no difference was made between black paint and black chrome. As a result, with a black paint M4 it's difficult to be absolutely certain about it being original. Real good repaints have surfaced that are almost indistinguishable from original ones. Repaints on the other hand are a whole different topic, which I will write a number of articles about in due time. While the decision to switch from black paint to black chrome was made to benefit the professional users, there were Leica aficionados who spoke out against it from the first moment the black chrome Leicas hit the shops. Sure they took a lot longer to wear off, but when they do, the chrome turns to a dull grey, silver chrome sheen. It was considered an ugly way of wearing by many, who longed for the (much better-looking) brass-showing wear of the 'old' black cameras. But Leitz had chosen the way of black chrome and planned to stick with it. The Leica CL and the M5 were not available in black paint at all, the Leica M4-2 and M4P weren't either and during the production run of the M4P Leica put a definite stop to the discussion and the complaints by introducing the Zinc-alloy top plates, which did not even have any brass and that was it. Yet, when the internet took on and information an pictures of the black paint cameras were spread more easily, the lust for the black paint models slowly took hold again. Around the turn of the century, the worn-down black paint cameras still spent months on end on the shelves at shops and dealers, nobody wanted them for their tatty looks. But after the year 2000, there is a steadily rising demand for the black paint cameras and as a result, Leitz have decided to give the serious amateur, the wealthy photographer and the senseless posers what they want: an expensive camera in black paint, that will wear pretty fast and make anyone look like a lifelong, diehard photo journalist. Even Lenny Kravitz got to be a correspondent, although the press release clearly stated that in his younger years, he spent time fondling cameras quite a bit more than actually photographing... Oh well. Factory-induced wear, freshly out of the box! During recent years, the prices paid by wealthy shooters and collectors have gone through the roof. Good looking black paint M4s now go for more than a second hand 'new' Leica MP in black paint (the model that was introduced in 2003, current retail price EUR 4250 including VAT), although they are likely to be fourty years older.